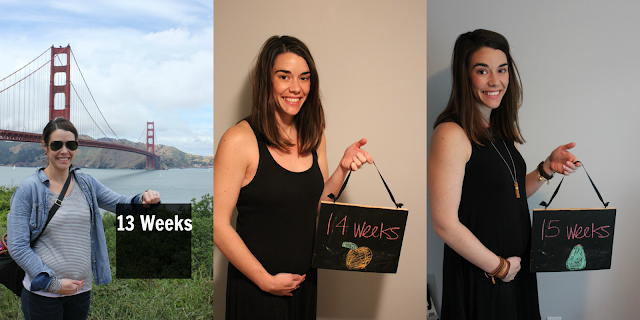 We're just crusin right along into the second trimester around these parts! I can't believe we are almost to week 16 already! Considering we've known since about 4 weeks, it seems like the past 12 weeks have gone SO fast but also I can remember the day we found out like yesterday. Cravings : We FINALLY had Jets. And it was amazing. There will be more Jets in the future. Lately its been smoothies and ALL the watermelon. And cheese and crackers. Aversions : This is getting better...still can't stand the thought of kale (no idea why) but thankfully coffee sounds slightly better. Maternity clothes : I picked up some goodies over Memorial Day thanks to a great Old Navy/Gap sale but haven't worn anything yet. Most excitingly, a good friend loaned me a ton of her adorable maternity clothes so I am very excited about that! Work outs : I have finally felt like running more lately so I've been doing a lot of that. By running I mean run/walk. I've been going about 3.5 miles lately, hoping to up that a little soon. Sleep : Well now that I have my magical pillow, wanting to get out of bed is quite the struggle. Movement : Felt some flutters/hiccups last week! It took me about half a day to figure out what it was but once I did, it was very exciting! Nursery : Waiting on the gender but we've started thinking about the transitions and creative storage solutions that room will need. Mood : Still doing well! Can't complain! Next week look for a wrap up of my first trimester essentials. Hint, it includes a lot of ginger ale. Finding out the gender is so fun!!!!! So excited for you friend. And yay for sales on maternity clothes and getting them passed along. I lived in borrowed maternity clothes!!! I JUST WANT TO KNOW IF I WILL HAVE A NIECE OR NEPHEW TO SPOIL! Minimal stress triggers... good to know yourself :) And there most definitely could be worse aversions than kale - that one cracked me up. Feeling movement already is SO exciting! Glad to hear you're doing well.